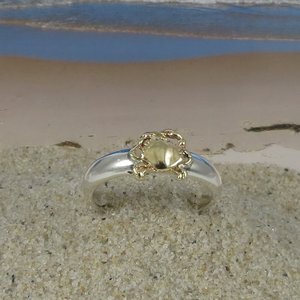 This hand crafted 14k gold and sterling silver ring is a simple yet elegant expression that will look great with anything you wear and always make you feel like the beach is close to your heart. Part of my "Stackers"TM collection I have designed many sea life styles that will overlap one another in a stacking fashion so that you can collect others to make versatile fun designs on different fingers. Each ring is hand made to order in 1/2 sizes ranging from size 4 to 10 1/2: Please specify in Notes to seller your desired size.